Questa driver board e' basata sulla ZXLD1360. 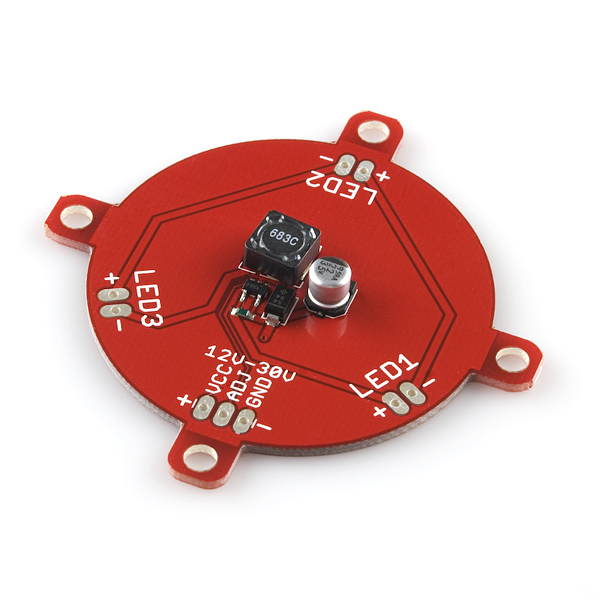 Ti permette di controllare 3 led con lo stesso driver. E' compatibile con la Luxeon Rebel Breakout board. Note: PWM control must be with an open pin (PWM high) or ground (PWM low). Do not pull the adjust pins high unless you want to drive the LEDs at greater than 650mA. The adjust pin on a ZXLD1360 driver chip causes the current to be off when it's held low, and on when it's open (or hi Z). Driving the pin at a DC level will cause the current regulation to be something other than the 650mA that the open adjust pin will regulate to, possibly much higher. Tread lightly if you don't know what you're doing.